This post isn’t about divorce. Not precisely, anyway. When I was married the first time, my then-husband expected me to perform more domestic “wifely duties,” and I refused. I still refuse (thankfully, Husband #2 is much more accepting of this trait). My house isn’t spotless. I don’t enjoy cooking. I don’t feel at home in the garden. In general, I find domestic chores to be an annoyance, at best. But today something funny happened. I was changing the sheets on my bed. After wrestling with the fitted sheet (a task which caused me to curse more than once), I spread out the flat sheet and discovered a rip in the fabric. Briefly, I considered leaving the sheet as it was… Then I imagined putting my foot through the hole in the middle on the night (it was big enough for my foot to fit). My next thought was that the sheet would need to be retired and repurposed– meaning, I’d put it in a cabinet with the intention of using it as a makeshift Christmas tree skirt (or something), but in actuality it would sit forgotten indefinetely. And then I had the strangest thought: I could fix it. Immediately followed by: Huh? Where did that come from? It was a odd idea, yet it felt like the right thing to do. So I plodded to the kitchen to retrieve the small sewing kit that lives under the counter. I cut a long piece of thread and miraculously threaded the needle on the first try (yay- that’s gotta be a sign!). Then I took my needle, thread, scissors, and torn sheet to my rocking chair (because it felt appropriate), and I set to work. Thinking ahead, I assumed the task would be a meditative experience, so I refrained from listening to any books or music while I worked. I imagined myself repeating a mantra and feeling deeply peaceful while my repair progressed. I stabbed myself more than once. Then the thread got tangled and tore. And my subsequent attempts to thread the needle were nowhere near as easy as the first (blerg!). 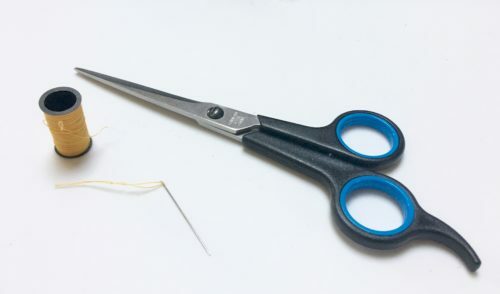 I realized I needed to be more careful– more mindful of my work as I looped the needle around the wounded fabric. I slowed down and employed additional fingers to guide the thread. Along the way, I noticed the tendency of the fiber to catch on the knobby edges of what I’d already sewn. And if I wasn’t careful, it would settle into the same groove as a previous stitch. I then began to consider the parallels between what was happening in my hands and what has happened throughout my life. I pondered the imperfections and attempted fixes. Regretfully, I recalled the years I strived only to follow or directly imitate those around me. I thought about the awkward starts and stops. The hangups and self-sabotages. The knots I took time to untie, and those mangled messes I discarded, deciding it was easier to cut my losses and move on. I accepted the fact that I’m still struggling to find my appropriate place in Everything. And of course, I thought about the times I hindered my own progress by getting stuck on what happened in the past. After I slowed my pace and indulged in my mindful personal reflection, the sewing went a little more smoothly. Before long, the rip was stitched shut and my sheet was good to go. I put the sewing kit back under the sink. Then I made my bed. Soon, I’ll sleep in it. Posted in Uncategorized and tagged chores, life, metaphor, sewing. ← What Did I See In Him?